© Quezada and Kane; Licensee Bentham Open. The Hepatitis C Virus RNA dependent RNA polymerase, NS5B, is stimulated by the NS5A protein in vitro. To explore this stimulatory mechanism, we compared the activity of a mutant of NS5B containing a deletion of the β-loop region with that of the full length NS5B in response to NS5A. While the NS5A protein does stimulate full length NS5B, NS5A does not stimulate the NS5B deletion mutant during either replication initiation or elongation. This result suggests that the activation mechanism might involve a NS5A-mediated conformational change of the β-loop of NS5B. Such a conformational change would be predicted to prevent steric clash of the RNA template and newly synthesized RNA product. Consistent with this hypothesis, RNA binding is enhanced when the full length NS5B and NS5A are incubated with RNA, but RNA binding is unchanged with incubation of NS5A and the NS5B β-loop deletion mutant. Keywords: Hepatitis C virus, NS5A, NS5B, regulation. The Hepatitis C Virus (HCV) replicates its viral RNA in a process mediated by NS5B, the RNA dependent RNA polymerase (RdRp)  that along with other host and viral factors carries out replication [2-4]. In vitro studies have revealed that the polymerase has very low activity most likely because it has poor productive RNA binding ability and low rates of nucleotide incorporation during initiation and elongation [5, 6]. These observations suggest that additional host factors are required to stabilize both binary and ternary complexes with the polymerase, template and incoming nucleotides. NS5A is one of several HCV proteins that co-immunoprecipitates with NS5B in replication complexes isolated from infected cells . NS5A has been shown to slightly stimulate NS5B , and we have determined conditions that dramatically improve that stimulation in vitro . We also have recently shown that NS5A in low concentrations stimulates NS5B during elongation although the mechanism is not known . The substoichiometric requirement to observe the stimulation suggests that NS5A makes a structural change in NS5B rather than maintains contact with NS5B during synthesis. The work described here begins to test this hypothesis. In vitro, NS5A stimulates NS5B when both proteins are pre-incubated prior to replication. The stimulation of NS5B is observed when NS5A is at sub-stoichiometric concentrations relative to NS5B (, and Fig. 1). Stimulation also is enhanced when templates derived from the 3’ UTR region of the viral genome are used [8, 9]. This template region is the start point for negative strand synthesis, that would generate template for making the positive strand viral genome for packaging. NS5B D 8 mutant is not affected by NS5A in the synthesis of the full length RNA. NS5B wt (0.9µM) or NS5B D8 (0.2 µM) was incubated with NS5A (26 nM, 260 pM, 2.6 pM) under the conditions previously described  with the LTMOA template (0.5 µM) for 60 min. The products of the reaction were separated on a PAGE-UREA gel, then exposed on a phosphorimager cassette and scanned. A structural analysis of NS5B has identified a β-loop in the thumb subdomain (residues 443 to 454) as both an essential domain for replication of the RNA genome and one that protrudes directly into the catalytic site . It has been reported that this domain would prevent initiation from the termini of viral double stranded RNA 3’end templates unless a rotational movement of the β-loop occurred. Therefore this domain would be essential for template recognition and likely also for efficient elongation as the RNA template and product would need access to the catalytic center during synthesis . In support of this idea, a NS5B deletion mutant that does not contain eight residues of the β-loop (NS5B D8) efficiently adds nucleotides to the end of a short RNA template  while the wild type enzyme does not. The NS5B D8 mutant also is more efficient in full length RNA synthesis. Thus, it seems plausible that NS5A affects the β-hairpin orientation. To test indirectly whether NS5A has an effect on NS5B activity through modifying the position of the β-loop, we used this NS5B mutant in replication assays with and without NS5A. If the stimulatory effect of NS5A was due to a reorientation of the β-loop of NS5B, then the NS5B D8 mutant polymerase would be insensitive to NS5A stimulation during replication reactions. The template used in this study (LTMOA) starts with a G less cassette of 21 nucleotides, and it is predicted to have a free 3’ end in RNA structure analyses. This template is used efficiently by the NS5B WT polymerase (Nam Vo, University of Pittsburgh, personal communication), and it was used previously to study the stimulatory effect of NS5A on NS5B . The activities of NS5B WT and NS5B D8 on this template were compared with and without NS5A. The results indicate that the β-loop is crucial for detecting NS5A stimulation in the formation of full length RNA product by NS5B (Fig. 1). While the wild type NS5B is stimulated by NS5A (Fig. (1), lane 8) as previously described, the NS5B D8 is unaffected by NS5A (Fig.1, lanes 2-4). Inhibition of replication by NS5B WT was seen in the presence of the highest concentration of NS5A as had been reported before . No such inhibition was seen with NS5B D8, further supporting the idea that NS5A has an effect on the structural rearrangement of the β-hairpin. A wide range of concentrations of NS5A and NS5B D8 was tested with no observed stimulation or inhibition (data not shown). We have previously shown that synthesis during early initiation with NS5B WT is not affected by NS5A . To analyze whether the mutant NS5B D8 also is insensitive to NS5A early in replication, the LTMOA template was incubated with NS5B WT or D8, NS5A, and a subset of nucleotides in the presence of α32P-ATP. While the levels of nucleotide incorporation are higher for the D8 mutant in these reactions, neither the D8 mutant nor the wild type NS5B is stimulated by NS5A in the synthesis of short RNA products (Fig. 2). Neither NS5B WT nor NS5B D8 mutant is affected by NS5A in the synthesis of the first 3 nt during replication in vitro. Either NS5B WT (0.9µM) or NS5B D8 (0.2 µM) NS5B was incubated with NS5A (2.6 pM, 26 pM, 260 pM, 2.6 nM, 26 nM, 260 nM) for 30 min on ice. Then the nucleotides (10 µM ATP, 3mM GTP, and 10 µCi [32P] ATP) were added along with the LTMOA template (0.5 µM) and incubated for 30 min at 30°C. The products of the reaction were separated on a 23% PAGE-7M Urea gel. Since NS5B has poor affinity for RNA and NS5A itself binds RNA , one hypothesis to account for the observed stimulation of NS5B by NS5A during elongation is that NS5A when in complex with NS5B could increase the affinity of the polymerase for the template during replication. To test this hypothesis, NS5A and NS5B at concentrations used in Figs. (1 and 2) were pre-incubated for 10 min on ice, labeled RNA was added and RNA binding was monitored over time (Fig. 3). The RNA binding by NS5B WT and NS5B D8 were compared in the presence or absence of NS5A. At the concentrations used, NS5A itself has RNA binding values close to the background (data not shown). At the same concentration, NS5A incubated with NS5B WT stimulates RNA binding 3-5 fold before it reaches saturation. The fold RNA binding stimulation is similar to the observed stimulation during RNA synthesis . Under similar conditions, no significant RNA binding increment was observed with NS5B D8 in the presence of NS5A (Fig. 3). In summary, NS5A increases the affinity of NS5B WT for RNA and stimulates full length product synthesis after initiation, but NS5B D8 is not stimulated by NS5A in either RNA binding or full length product synthesis. 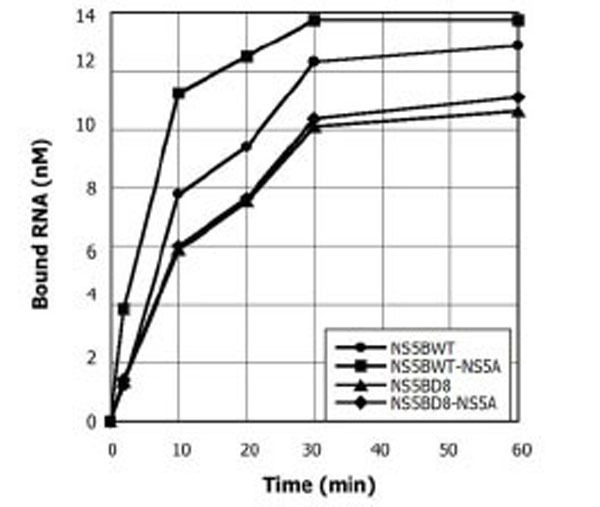 NS5A increases the affinity for RNA template binding of the NS5B-WT but not NS5B-D8 mutant. 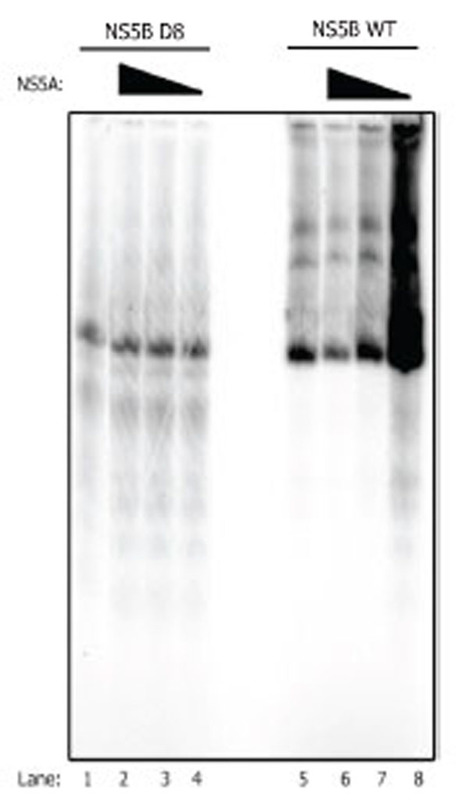 NS5A (2.6 pM) was incubated with NS5B WT (0.9 µM) or NS5B D8 (0.2 µM), then labeled LTMOA RNA was added to 0.2 µM and the reaction was incubated for 0, 2, 10, 20, 30 or 60 min. Samples were examined in a filter binding assay. To quantify, the labeled RNA retained on the membrane was compared to a standard of known RNA concentration. In the purified NS5B structure, a β-loop nearly caps the catalytic center . 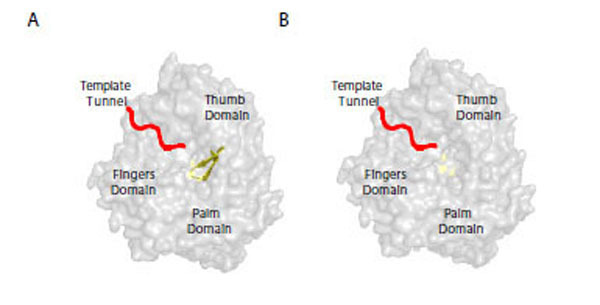 It has been proposed to be a “gate” promoting replication from the 3’ end of template RNA . Thus, this structure is important in both initiation and elongation of the RNA product. To investigate the likelihood of a β-loop rearrangement of NS5B in response to NS5A, the NS5B structure  was used to compare the catalytic site region with and without the β-loop (Fig. 4). A structural rearrangement of the β-loop region of NS5B would prevent a physical constraint for RNA elongation when the polymerase is actively engaged in RNA synthesis (Fig. 4A). To avoid steric clashes, the β-loop most likely moves away from the catalytic site (Fig. 4B models NS5B without this loop), allowing the movement of the growing chain and the template as they exit the catalytic site. In addition, alignment modeling of the Phi6 RNA dependent RNA polymerase structure crystallized with a short template  with the NS5B structure  suggests that the β-loop of NS5B allows only synthesis of a short product unless the β-loop rotates away from the catalytic site. This modeling provides an explanation for our results comparing the full length NS5B with the β-loop deletion mutant, D8. Model of NS5B with a cartoon template RNA. NS5B (pdb code: 2I1R) structure showing the active site located in the palm domain and the regions of the protein that would interact with the RNA in the fingers domain to localize the template tunnel and the β-loop. The β-loop element (Fig 4A) is shown in yellow in the NS5B structure. Figure 4B depicts the same view of the active site without the β-loop. Thus, based on the results presented here, a possible mechanism through which NS5A could stimulate NS5B is by direct interaction with the β-loop of NS5B. By doing so, NS5A could rearrange the position of the β-loop such that the RNA can freely enter and leave the polymerase active site during elongation. Note that this rearrangement would need to happen only once in replication as the template and product RNAs exiting the polymerase would keep the channel open as long as replication were occurring. This mechanism could explain why a substoichiometric amount of NS5A is needed to stimulate NS5B in vitro. In addition, the effect of NS5A’s rearrangement of the β-loop of NS5B most likely only occurs when the product RNA is of certain length during elongation, and not during the synthesis of short products (i.e. <3nts); once the β-loop moves aside and the “lid” is opened by RNAs of a certain length, it remains open during the elongation process. Thus, NS5A does not reduce the number of pause sites experienced by NS5B but rather reduces the residence time at each pause site because of the structural rearrangement in NS5B . Of course, the stimulation by NS5A might also be dependent on the structure and stability of the binding of the RNA template or even the template sequence, all testable hypotheses. Also kept in mind are the previous reports  that point to the β-loop as important for terminal initiation. Perhaps, in addition to its role in such initiation, the β-loop rearrangement enables active elongation of RNA products during replication. EMQ was funded through a training grant awarded to the Department of Molecular and Cell Biology at the University of California, Berkeley. The work was funded by the Teenie and Tigre Biomedical Research Effort. We gratefully acknowledge Dr. Meindert H. Lamers and Dr. Blake Wiedenheft for help with the structural modeling in the course of this work. We also thank Dr. Craig Cameron for the NS5B deletion construct. Lohmann V, Korner F, Herian U, Bartenschlager R. Biochemical properties of hepatitis C virus NS5B RNA-dependent RNA polymerase and identification of amino acid sequence motifs essential for enzymatic activity Virol J 1997; 71: 8416-28. Tellinghuisen T, Rice C. Interaction between hepatitis C virus proteins and host cell factors Curr Opin Microbiol 2002; 5: 419-27. Tu H, Gao L, Shi S T, et al. Hepatitis C virus RNA polymerase and NS5A complex with a SNARE-like protein Virology 1999; 263: 30-41. Randall G, Panis M, Cooper J D, et al. Cellular cofactors affecting hepatitis C virus infection and replication Proc Natl Acad Sci USA 2007; 104: 12884-9. Cramer J, Jaeger J, Restle T. Biochemical and pre-steady-state kinetic characterization of the hepatitis C virus RNA polymerase (NS5BDelta21, HC-J4) Biochemistry 2006; 45: 3610-9. Carroll SS, Sardana V, Yang Z, et al. Only a small fraction of purified hepatitis C RNA-dependent RNA polymerase is catalytically competent implications for viral replication and in vitro assays Biochemistry 2000; 39: 8243-9. Binder M, Quinkert D, Bochkarova O, et al. Identification of determinants involved in initiation of hepatitis C virus RNA synthesis by using intergenotypic replicase chimeras Virol J 2007; 81: 5270-83. Shirota Y, Luo H, Qin W, et al. Hepatitis C virus (HCV) NS5A binds RNA-dependent RNA polymerase (RdRP) NS5B and modulates RNA-dependent RNA polymerase activity J Biol Chem 2002; 277: 11149-55. Quezada E M, Kane C M. The hepatitis C virus NS5A stimulates NS5B during in vitro RNA synthesis in a template specific manner Open Biochem J 2009; 3: 39-48. Hong Z, Cameron C E, Walker M P, et al. A novel mechanism to ensure terminal initiation by hepatitis C virus NS5B polymerase Virology 2001; 285: 6-11. Huang L, Hwang J, Sharma S, et al. Hepatitis C virus nonstructural protein 5A (NS5A) is an RNA-binding protein J Biol Chem 2005; 280: 36417-28. Butcher S J, Makeyev E V, Grimes J M, Stuart D I, Bamford D H. Crystallization and preliminary X-ray crystallographic studies on the bacteriophage phi6 RNA-dependent RNA polymerase Acta Crystallogr D Biol Crystallogr 2000; 56: 1473-5.